BITSAT – Birla Institute of Technology and Science (BITS) Admission Test is a computer-based online test conducted by BITS, Pilani. This is for admission into India's top non-IIT engineering college. (i) For admission to all the programmes except B.Pharm. : Candidates should have passed the 12th examination of 10+2 system from a recognized Central or State board or its equivalent with Physics, Chemistry, and Mathematics and adequate proficiency in English. (iii) Candidates must have obtained 75% marks in PCB or PCM group. (iv) Aspirants who have passed 12th or equivalent exam in 2015 or earlier are not eligible to apply. 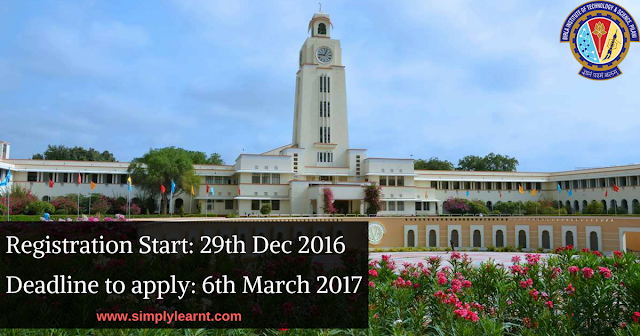 Deadline to apply for BITSAT-2017 online along with the fee payment is 5.00pm on 6th March 2017 (Monday).